In the mid-1990s, two couples -- Mike and Carol Gingrich and Dan and Jeanne Patenaude -- bought a farm in the Uplands area of Wisconsin, an expanse of rolling hills and valleys that were left untouched by the Ice Age glaciers. 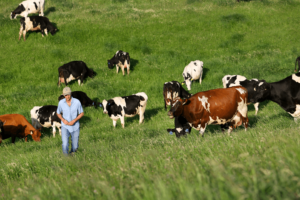 The families grazed their mixed herd of cows seasonally on beautiful fields of grasses, legumes and herbs, and soon began to realize that the milk their herd produced was exceptional and likely perfect for cheesemaking. 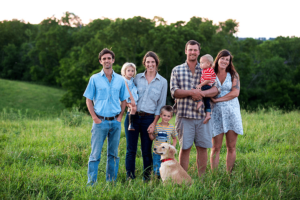 In 2013, Uplands' founders sold the farm to the next generation -- cheesemaker Andy Hatch, herdsman Scott Mericka and their families -- helping to ensure the farm's future. We all know that great cheese starts with great milk but where does great milk start? The feed of course! The folks at Uplands take great pride in their rotational grazing program. Their farm spans over 300 hilly acres and the open pasture is separated into small paddocks. Each day, the cows are moved to a new paddock, which means fresh grass for the herd and time for each pasture to regrow between feedings without becoming over-grazed. The result is extremely flavorful milk, healthy animals (they're getting some exercise in the process!) and carefully tended land for sustainable farming practices each year. Uplands' first cheese, Pleasant Ridge Reserve, shows how truly amazing artisan American cheese can be. Made only during May through October with raw milk, each wheel truly expresses a sense of place. Loosely based on the French Beaufort, which is also made from grass-fed milk, Pleasant Ridge is rich and hearty with complex layers of caramel and nuts. Our current batch had notes of quiche, stewed greens and chocolate covered espresso beans on the finish. 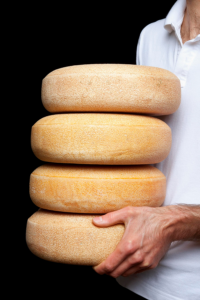 Pleasant Ridge Reserve won Best in Show at the American Cheese Society's annual competition in 2001, 2005 and 2010, making it one of the most decorated cheeses in our industry.